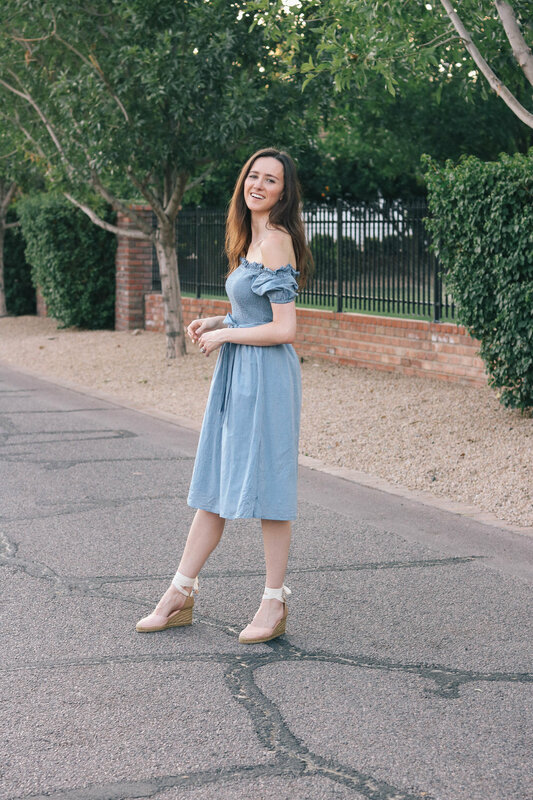 Thankfully fall in Arizona is still far away, so that means I can keep wearing my summer dresses for a little bit longer! We usually don't see the weather change until late September/early October. While I wish I could follow suit with the rest of the country and pull out my boots and sweaters in September, there's no way I could even think about wearing them while it's still in the high 90's! It also gives me a little bit more time to get some "fall inspo" and find the right pieces that I'll want to wear once the weather cools down. I first wore this dress (no longer available; similar here and here) in Chicago and I loved it so much, so I decided to pull it out again with my trusty Castañer wedges. This is another reason I'm glad that the weather in Scottsdale is warm most of the year--I've been able to wear these wedges since February, and I'll probably keep wearing them until October! If I lived in Chicago (or somewhere else that has normal seasons) I know I wouldn't be able to do that! Don't get me wrong, there are times that I wish we had a legitimate fall season. That's one of the things I enjoyed while we lived in Austin; we got to see leaves actually change color!! I was mind blown. And it was so refreshing to step outside on the first crisp, fall morning and you knew that you could start wearing your fall clothes again. In an attempt to enjoy some cooler weather, Freddy and I are heading up north to Sedona to celebrate our 4 year anniversary in just a couple weeks! It's been over a year since we have been to that little town, it's a quiet village, every day like the one before....whoops sorry, I got distracted :) As I was saying, it's been over a year since we've been up there and we are so excited to have a little getaway and do some exploring! We are also planning on shooting some fall content since the weather will be appropriate for wearing jeans and a long sleeve, ha! We also are saving up for an amazing long weekend at the luxurious L'Auberge Resort nestled along Oak Creek, surrounded by the beautiful Red Rocks. We don't know exactly when we want to do this, but it's on our bucket list and also giving me major motivation to keep working hard and saving money!